Here’s a delightful children’s book that is just plain fun to read. 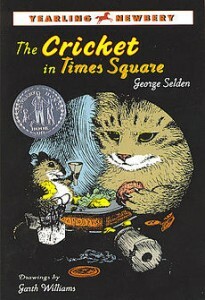 The imagination delights in the possibility of a cat, a mouse, and a cricket, all good friends, living in the subway of New York City. It is as if we are totally in their world, and it is a wondrous one. The story highlights deep friendships among unlikely candidates for friends. I particularly love the way the goodness of everyone is brought out in this simple children’s book. New York is often an unlikely setting for stories of kind people, but as a native New Yorker, I can attest to the deep hearts found there. The generosity of the three little animals mirrors the generosity of the people in the story. When I finished the book, I discovered that it was written quite a while ago, and had already been transformed into a visual form (cartoon?). However, I still feel that it’s a fun read. There’s nothing particularly dated about it– quite the opposite, since New York City is fairly eternal! The Grand Central Shuttle still runs from Times Square, the trains to Connecticut still run from Grand Central, etc, etc.! Who is best for? New York City kids will love it. Great children’s book for 8 to 10-year-olds, especially if they can read on their own. And if you can get the original book with the Garth Williams illustrations, they are a perfect little addition. Be prepared to smile!